I love my creative space. I'm talkin' LOVE. It's my escape.....my joy.....my link to sanity. It's my favorite place to be, and I spend a lot of time here. I do my creating at a large stand-up height table that my hubby built for me. it's easier to see what I'm doing when looking straight down on it. 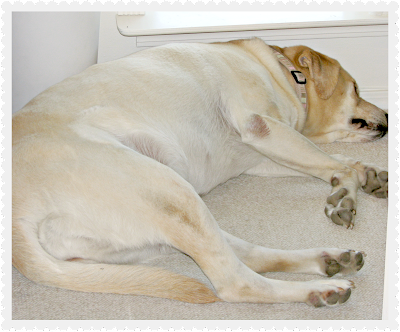 My sweet little (116 lb) Molly likes to keep me company. My sweet, chippy, squeaky old chair is where I spend a lot of time, lost in blogland. 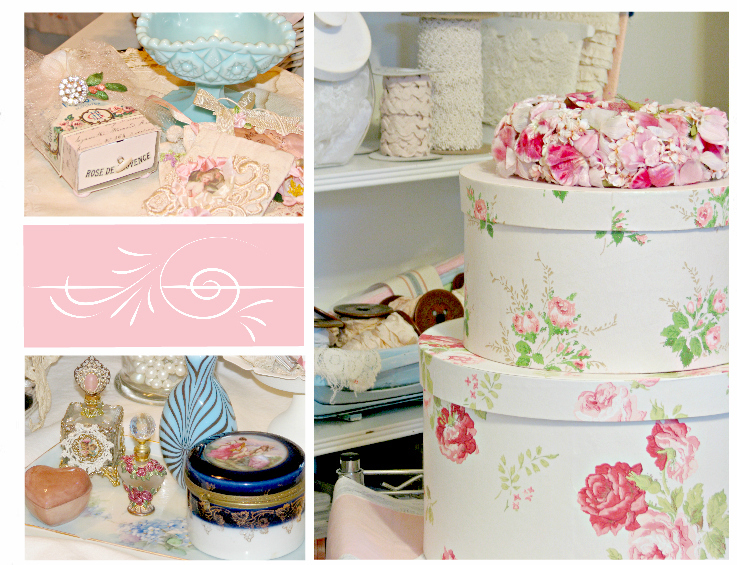 I love working with pretty papers, laces, ribbons, flowers, and bling. And sewing with pretty fabrics and lace has become one of my favorite things to do. Every day includes at least a small amount of time creating. as well as many of my supplies. It helps get my creative juices going. Karen's 'Where Bloggers Create' party. for a week of crafting at the cabin. 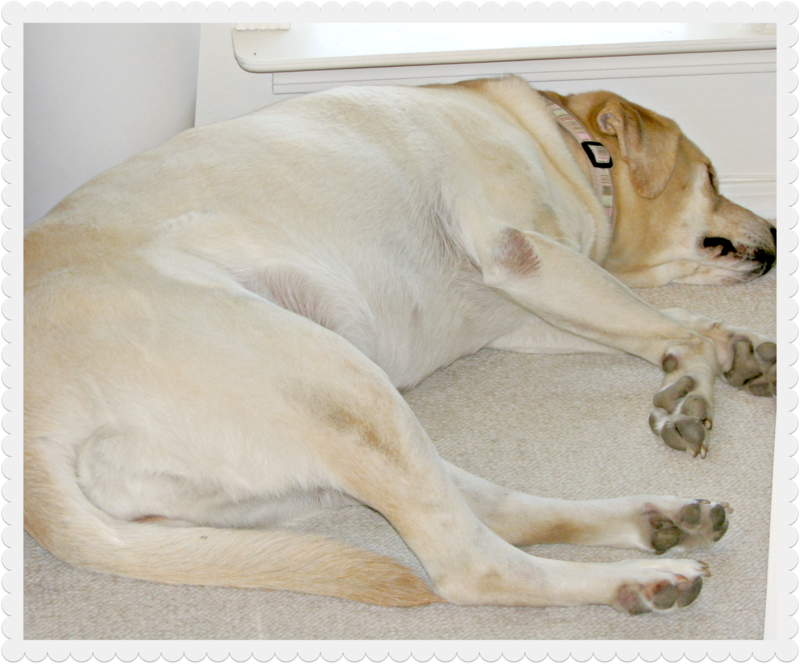 Check out Karen's blog for the list of other participants. Have a sweet, creative week! It is like a dream in your corner of the world. So pretty for inspiration by so organized for function. Just beautiful. 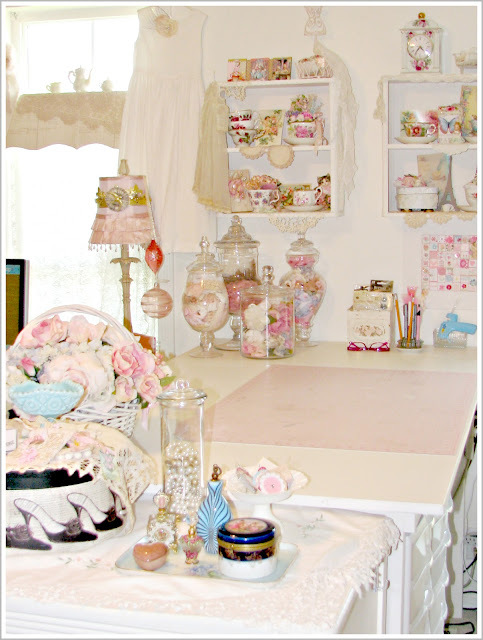 Your studio is just so beautiful and it looks as though you have a lot of lovely supplies! How FUN! Debi your studio is just beautiful!! Thank you for sharing it with us! Your studio is oh so dreamy! All those pinks and creams MUST make you happy! I just love your studio! Filled with so much eye candy and inspiration!! Beautiful, feminine, pretty, inspirational as always, darling debi. Have fun crafting! Oh my goodness! 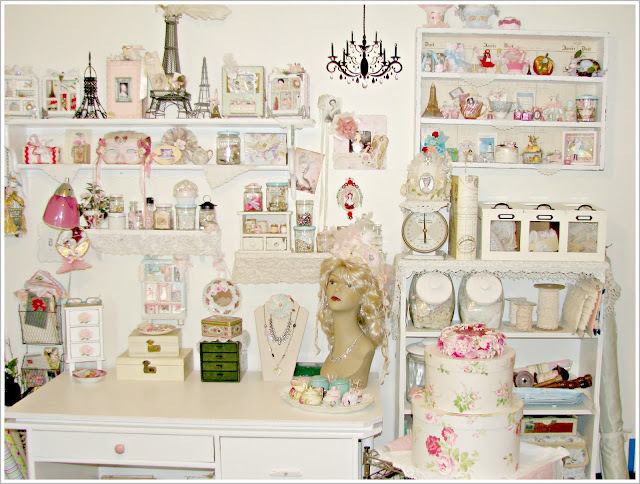 What a beautiful studio I love all the things you chose to decorate your space from the rose pattern boxes to the pretty glass jars. Thank you for sharing your pink wonderland. I think your stand up table is a grand idea. Love your style! Your space is just absolutley lovely! What a wonderful space to create in! I absolutely love your studio! Oh so gorgeous and oh so Debi! I LOVE it! Your studio is just beautiful, so feminine and pink. I just love it. Thanks for sharing. 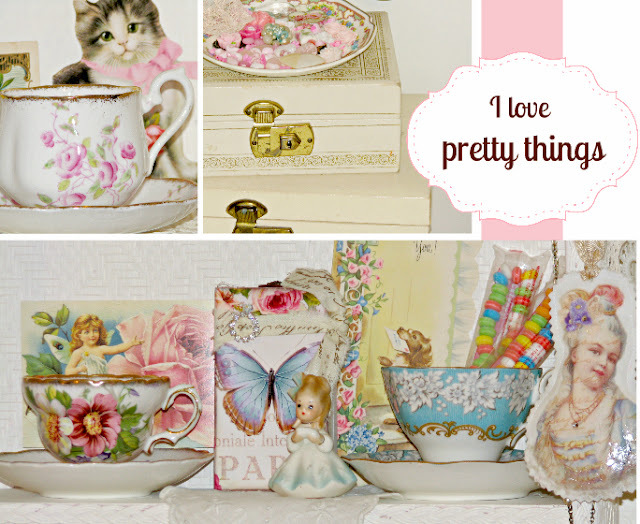 Debi it is beautiful and full of inspiration! I like the thought of a stand up area table- Does your feet and back have a tendency to hurt after awhile? I can walk and sit ...there is something about just standing that messes me up! I wish I could just come and be nosey and peek in all those nooks and crannies to see all the treasures within- maybe bring a big bag with me too! I love all the different heads. Very nice space. Thanks for letting me visit. Oh.My.Goodness. It is easy to see why you love being in this room. It is so well organized and SO beautiful. Eye candy galore!! Thank you for sharing. Gorgeous!!!! Truly beautiful!!! What more can I say?? It's so sweet and pretty and feminine. No wonder you love to spend time in there!! Thank you so much for joining the party and sharing it with all of us!! How beautiful Debi! Your studio is so light, airy and lovely! I adore all the treasures tucked away to surround you with beauty. Thank you for sharing your space! What a gorgeous light filled studio you have. So beautiful. Pretty pink passion! A true treat for the eyes, thank you for sharing your brand of beauty and creativity. What a beautiful place to play my friend!!! No wonder you create such beautiful art! 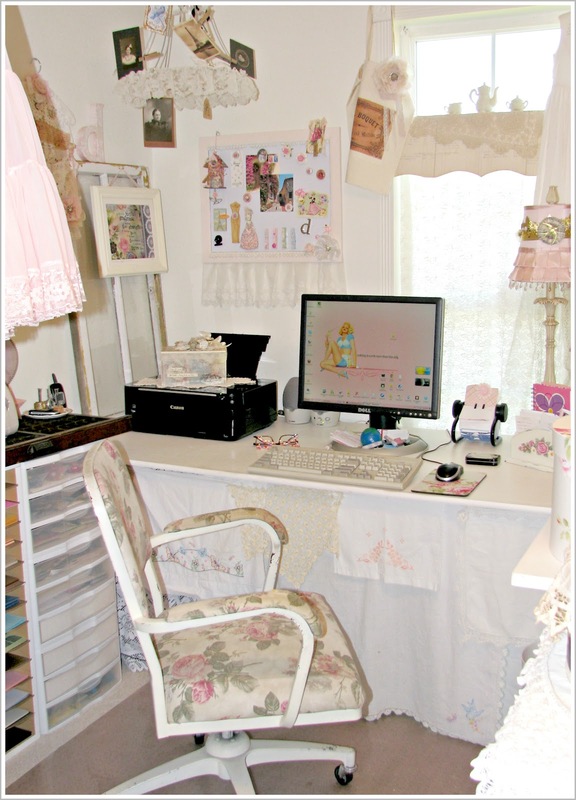 I LOVE your creative space, Debi! I would be in heaven in here ~ even just to visit! : ) You've used my favorite colors and it makes it so light and bright. I can't even imagine the fun and inspiration you find in this room. I love so many things ~ the mannequin dressed in lace, your storage, your goodies in those great glass containers and even your chair! Thanks so much for sharing your creative space! Knew I'd love your studio after seeing the Mannie head with the Vintage Hat! Love all the Whimsey and Vintage! 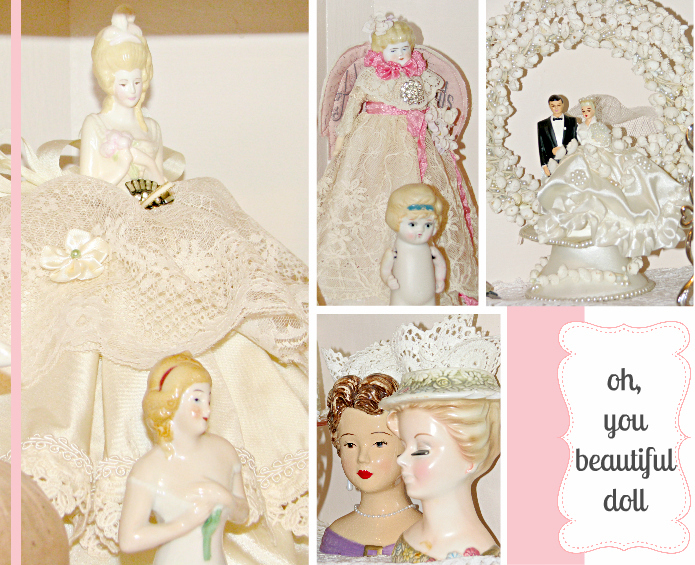 I have a little Giveaway on my WBC post if you want to stop by! What a beautiful and soothing space......really dreamy...thanks for sharing! 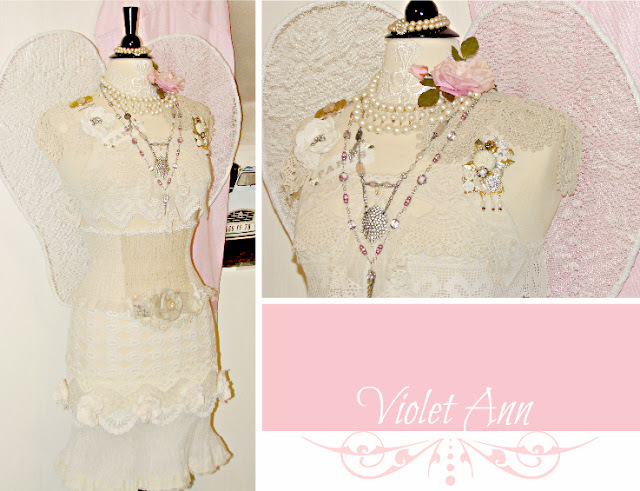 What a beautiful and feminine room!Violet Ann looks gorgeous all dolled up! 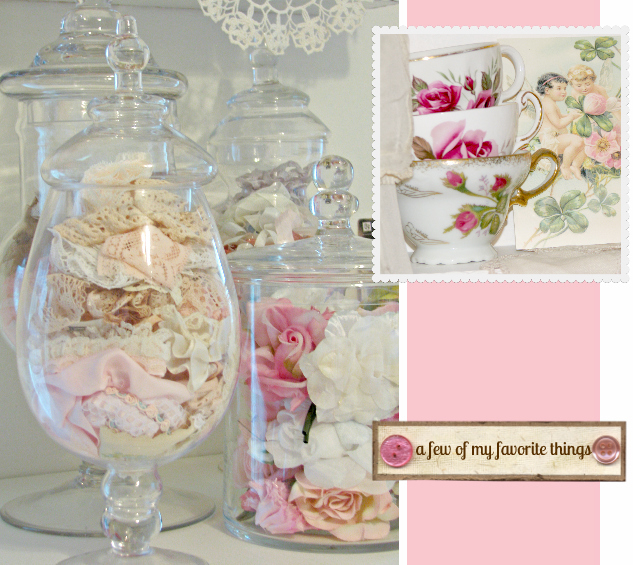 The lace looks wonderful in the glass jars too! TFS! Hi, Debbie! While looking at your studio, I was doing a Broadway number in my head.... singing, I Enjoy Being a Girl!" 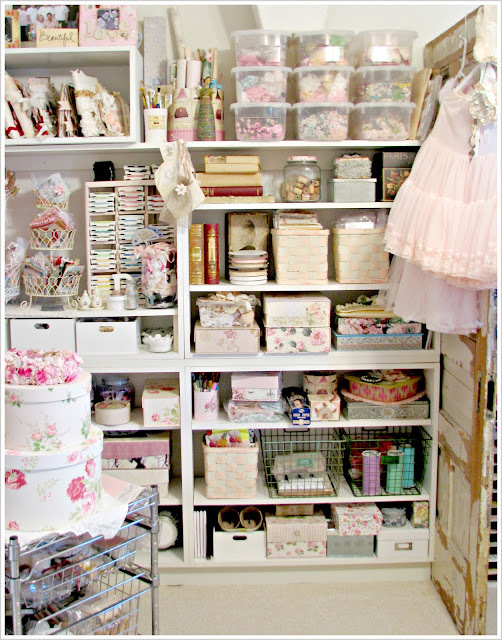 LOL Such girlie madness everywhere with papers, laces, trims, mannequins, tea cups..... so much to look at and admire! I also honed in on your chair. At the moment I am searching for just the right chair to spend time in front of the computer. It has to be just so so that my back doesn't start acting up. And yours has been beautifully transformed! Hmmmm..... got me to thinking! Thanks for sharing your space with all of us! I plan on visiting again! Love your pretty white studio!!! So many pretties you have. Thank you for visiting my room. 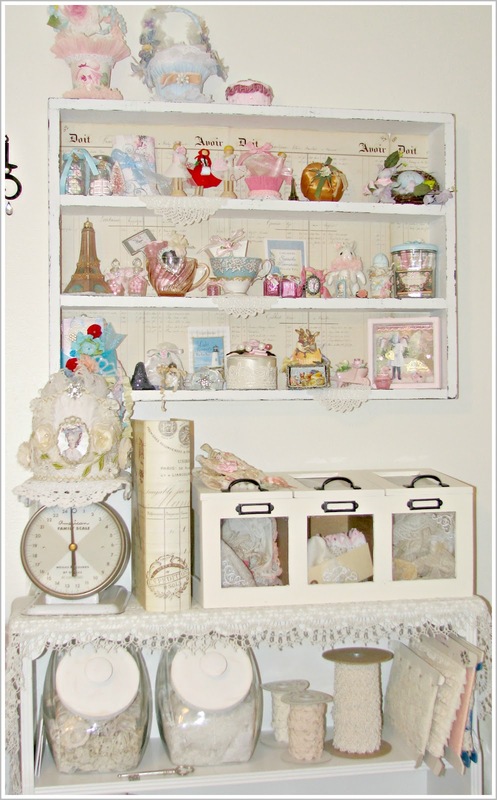 Not sure which I am more jealous of, your craft room or your cabin!!! Both look like such peaceful and creative spaces. You are a lucky lady. Thank you for sharing your space with us! Your creative space is so yummy! Love the pink and white and lace and dolls! Thank you for sharing with us! 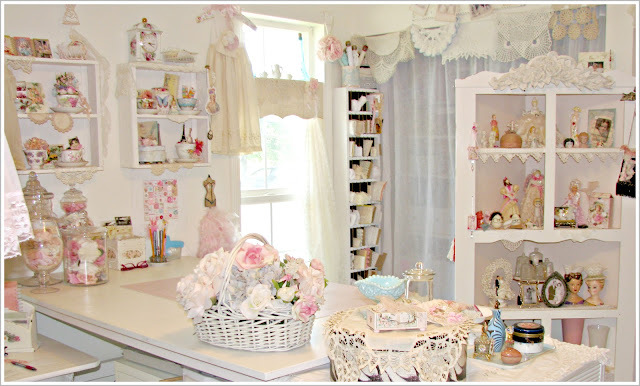 What a completely feminine studio, the colours, the beautiful accents and your treasures - it's so dream like! This must be a truly special place for you to work in , congratulations on creating such a beautiful space! So wonderful!Even I can't choose some words for describe my feelings! How have you been debi? It's been a while....hope everything is okay. Miss you. 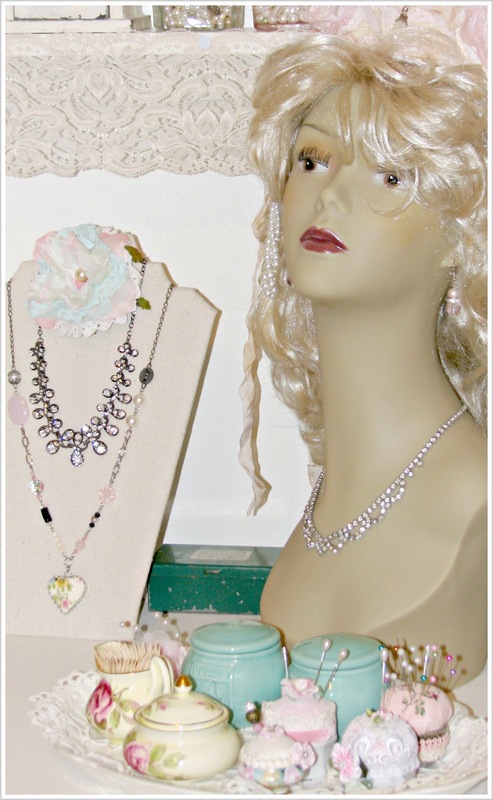 So sweet, feminine and dreamy! I love your lace and trim collection, hmmm. Oh my! No wonder you love your room! I love it too! It is pink deliciousness for sure! I don't know how I missed this post! I had to check and see if I had already commented, with my memory, who knows! Lol! But no! So somehow I missed it! Thank you so much for sharing your beautiful creative space. Next year, I hope to participate. Wishing you a very Merry Christmas sweetie!